Ofsted’s chief inspector delivered a keynote speech to bring this year’s Association of Colleges conference to a close today. 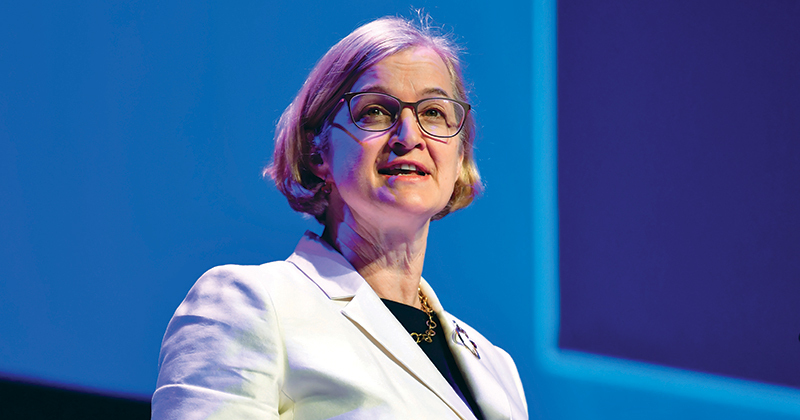 Amanda Spielman talked delegates through the new common inspection framework and what it means for FE, a crackdown on “teaching to the test”, and the inspectorate’s new level 2 report, among other things. FE Week has pulled out the seven main takeaway points. The chief inspector said Ofsted’s level 2 report found that some subjects, namely arts and media, “stand-out” as areas where there is “mismatch between the numbers of students taking courses and their future employment in the industry”. “If so, this isn’t acceptable,” Ms Spielman added. Ofsted wants to send a “clear message” that “teaching to the test to achieve high achievement rates is not good practice, and that there is no need to continually assess learners to predict likely achievement grades,” Ms Spielman said. She added that time is “far better spent” making sure learners “accumulate all the required knowledge, skills and behaviours”. Ms Spielman spoke delegates through the three main proposed changes in the new CIF, which will be piloted early next year ahead of its introduction in September 2019. “The first change is losing outcomes as a stand-alone judgment,” she said. “The second change is broadening the existing quality of teaching, learning and assessment judgement into a quality of education judgement. This one will include curriculum alongside teaching, learning and assessment, and will also reflect outcomes. There will be no separate outcomes judgement. Ms Spielman said Ofsted wants to “make it easier for people, particularly employers, parents and students”, to find the information they need from inspection reports. Therefore, the inspectorate is “planning to simplify the classifcation of provision types that we inspect”. “We will consult on reducing this from the current 6 categories down to 3,” she said. The chief inspector added that Ofsted is “particularly concerned” that provision for learners with high needs and with special edcuation needs and disabilities will be “well and truly represented within these three provisions types”. Ms Spielman said that inspectors in FE have “always considered the appropriateness of the curriculum” when arriving at inspection judgements. But in the new framework, there will be a “stronger emphasis”. “The content of the curriculum and the way that this content is taught and assessed will be a bigger part of inspection activity,” she explained. The chief inspector said one “common strength” of good level 2 provision is “success in developing personal, social and employability skills”. “For many level 2 students, not reaching a good pass in any GCSEs can generate a sense of failure and dent their self-belief and confidence,” she told delegates. “A relatively high proportion of these students are likely to be from disadvantaged backgrounds. Teachers’ priorities were to get students to experience success, as well as address habits and attitudes to secure a positive next step. Confirming what FE Week revealed last week, Ms Spielman commended colleges for improving their performance last year, including a “9-point rise in the proportion of general FE colleges rated ‘good’ or ‘outstanding’”. “It has been particularly pleasing to see a number of colleges, who had been either ‘inadequate’ or ‘requires improvement’ for extended periods, break that cycle and get to ‘good’,” she said, and gave “well done” shout-outs to Waltham Forest and The City of Liverpool College among others. The first point is fundamentally wrong and shame on you for not challenging this. The creative industry contributes £92 billion to the UK economy, careers in this sector are growing at 4 times the pace of other sectors, there are 2 million people directly employed in the creative and media sector and another 3 million people employed in other roles within the sector. Not to mention the transferable skills these courses provide that will be critical in helping the UK meet the challenges of the future. To say colleges are giving false hope is patently wrong and this narrative needs to change. There always appears to be this assumption that all providers are on the fiddle – Some are yes, but I’d venture that the vast majority are being driven into certain behaviours as a result of poor policy and funding rates. One example of this would be chasing achievement rates to get a good Ofsted grade – I’m glad to see that Ofsted recognise this.